Download Lenovo Energy Management software : Lenovo Energy Management software is a best tool to manage power consumption and charging. This application helps to increase battery life. 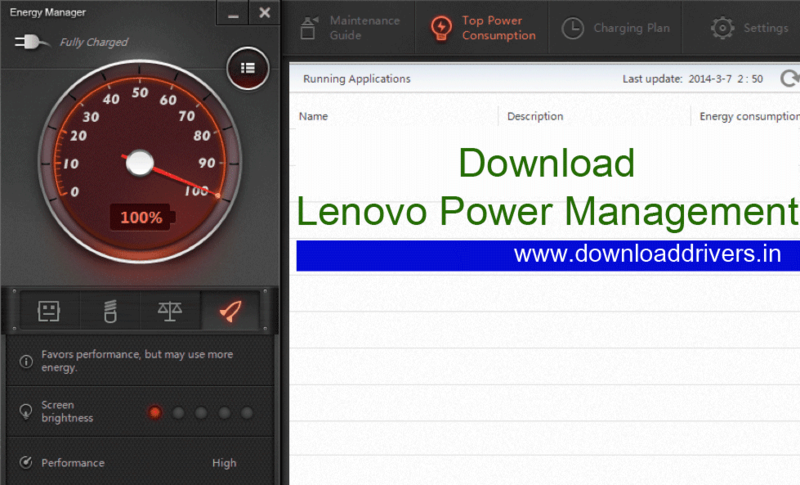 Today we would like to share power management software for Lenovo laptops. You can download the energy management software for your Lenovo laptops from the below list. ThinkPad E470, E470c, E570, E570c, E560p. Lenovo B430, B475e, B480, B490, B575e, B580, B590. Lenovo V480, V480c, V480s, V490u, V580, V580c. ThinkPad A20m, A20p, A21e, A21m, A21p, A22e, A22m, A22p, A30, A30p, A31, A31p. ThinkPad 11e (Type: 20G9, 20GB). ThinkPad Edge 11", 13", 14", 15". ThinkPad Edge E10, E30, E31, E40, E50,E130, E135, E330, E335, E430, E430c, E431, E435, E445, E530, E530c, E531, E535, E545, E120, E125, E220s, E320, E325, E420, E420s, E425, E460, E465, E520, E525, E560, E565. ThinkPad L330, L410, L412, L420, L421, L430, L460, L470, L510, L512, L520, L530, L560. ThinkPad P40 Yoga, P50, P50s, P70, P51, P51s, P71. ThinkPad R30, R31, R32, R40, R40e, R50, R50e, R50p, R51, R51e, R52, R60, R60e, R60i, R61, R61e, R61i, R400, R500. ThinkPad T20, T21, T22, T23, T30, T40, T40p, T41, T41p, T42, T42p, T43, T43p, T60, T60p, T61, T61p, T400, T400s, T410, T410i, T410s, T410si, T420, T420i, T420s, T420si, T430, T430i, T430s, T430si, T430u, T431s, T440s, T440, T440p, T460, T460s, T460p, T470, T470s, T500,T510, T510i, T520, T520i, T530, T530i, T560, T570. ThinkPad X1, X1 Carbon, X1 Carbon (Types:20A7, 20A8), X1 Hybrid, X1 Helix, X1 Helix 3G, X1 Carbon (Machine types: 20K3, 20K4), X1 Yoga (Machine types: 20FQ, 20FR), X1 Yoga (Machine types: 20JD, 20JE, 20JF, 20JG), X1 Tablet(Machine types: 20GG, 20GH). ThinkPad X20, X21, X22, X23, X24, X30, X31, X32, X40, X41, X41 Tablet, X60, X60s, X60 Tablet, X61, X61s, X61 Tablet, X100e, X120e, X121e, X130e, X131e, X200, X200s, X200 TabletX201, X201i, X201s, X201si, X201 Tablet, X201i Tablet, X220, X220i, X220 Tablet, X220i Tablet, X230, X230i, X230s, X230 Tablet, X230i Tablet, X240s, X240, X260, X300, X301. ThinkPad Yoga 14, ThinkPad Yoga 460, ThinkPad S3, ThinkPad Yoga 260, ThinkPad Yoga 11e 3rd gen.
ThinkPad W500, W510, W520, W530, W700, W700ds, W701, W701ds. Lenovo B430, B480, B490s, B580, B4400, B5400, M4400s, M5400, M5400 Touch. Lenovo V4400u, V480, V480s, V490u, V580. Zhaoyang E49, Zhaoyang K29, Zhaoyang K49. Edge 11, Edge 13, Edge 14, Edge 15. Edge E10, Edge E30, Edge E40, Edge E50, Edge E120, Edge E125, Edge E130, Edge E135, Edge E145, Edge E220s, Edge E320, Edge E325, Edge E330, Edge E420, Edge E420s, Edge E425, Edge E430, Edge E430c, Edge E431, Edge E435, Edge E440, Edge E445, Edge E520, Edge E525, Edge E530, Edge E530c, Edge E531, Edge E535, Edge E540, Edge E545, E450, E450c, E455, E460, E465, E550, E550c, E555, E560, E560p, E565. L410, L412, L420, L421, L430, L440, L450, L460, L510, L512, L520, L530, L540, L560. R51e, R52, R60, R60e, R61, R61e, R61i, R400, R500. SL300, SL400, SL400c, SL410, SL500, SL500c, SL510. ThinkPad P51s (Machine types: 20JY, 20K0). T43, T43p, T60, T60p, T61, T61p, T400, T400s, T410, T410i, T410s, T410si, T420, T420i, T420s, T420si, T430, T430i, T430s, T430si, T431s, T440, T440p, T440s, T450, T450s, T460, T460p, T460s. ThinkPad T470 (Machine types: 20JM, 20JN), T470s (Machine types: 20JS, 20JT), T500, T510, T510i, T520, T520i, T530, T530i, T540p, T550, T560. ThinkPad T570 (Machine types: 20JW, 20JX). W500, W510, W520, W530, W540, W541, W550s, W700, W700ds, W701, W701ds. Yoga, Yoga 12, Yoga 14 (Type 20DM, 20DN), Yoga 15. X1, X1 Hybrid, X1 Carbon. ThinkPad X1 Carbon (Machine types: 20K3, 20K4). X32, X40, X41, X41 Tablet, X60, X60s, X60 Tablet, X61, X61s, X61 Tablet, X100e, X120e, X121e, X130e, X131e, X140e, X200, X200s, X200 Tablet, X201, X201i, X201s, X201 Tablet, X220, X220i, X220 Tablet, X220i Tablet, X230, X230i, X230s, X230 Tablet, X230i Tablet, X240, X240s, X250, X260, X270, X300, X301. ThinkPad X1 Yoga (Machine types: 20FQ, 20FR). ThinkPad Yoga, Yoga 260, Yoga 460. 0 Response to "Lenovo Energy Management Software download for Windows "